World Theatre Day is celebrated every year on March 27. The day was initiated in the year 1961 by the International Theatre Institute (ITI). The day appreciates the medium of theatre and various events are organised internationally to mark this day. ITI Centres and the international theatre community organize events all over. On this day, the organisation has a figure of major stature speaking on the theme of Theatre and a Culture of Peace. So a World Theatre Message is sent out on this day by the particular person. This day is essential to value the art form of 'theatre' which is no more gaining that popularity as it used to before. Memorable Quotes On Theatre by Renowned Artists. The celebrations of the World Theatre Day began in the year 1961. A yearly message is given out by a famous theatre personality and offer their views and insights about the medium of theatre and its future. The first World Theatre Day Message was written by Jean Cocteau in 1962. This message is translated in over 50 languages and send across so that everyone world over gets the message. 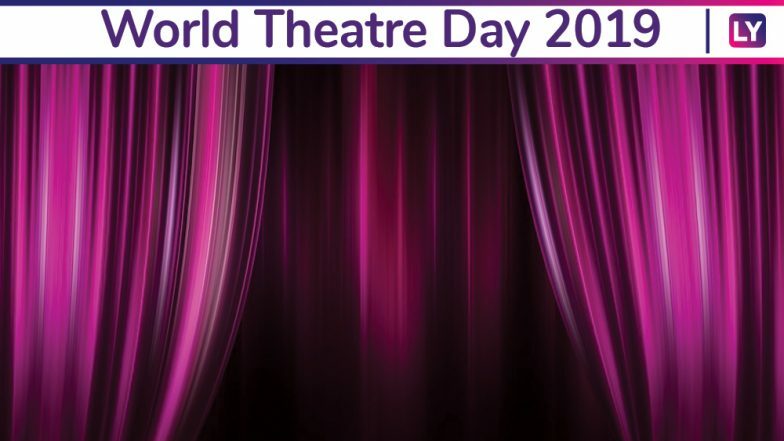 ITI has more than 85 centres throughout the world to encourage colleges, schools and theatre personalities to mark this day. This year the speaker of World Theatre Day message is Carlos CELDRAN from Cuba. He is an award-winning theatre personality, director, playwright, academic and professor. He has been a great inspiration to many and continues to help others by working as a professor at high-level institutions in Cuba, South America and Europe. Each year, World Theatre Day sees various programmes and events which talk about the medium. In the age of technology, people are more open to web content. Online streaming platforms give many forms of entertainment at the user's comfort. But the medium of theatre remains special in its own way and should be appreciated.